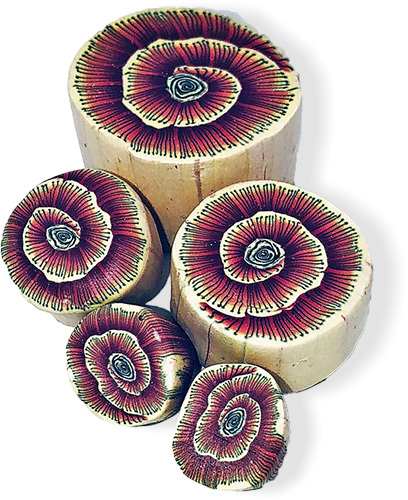 It was a logical progression for illustrator and Zentangle enthusiast Anita Long (neeneeree) from Indiana to translate her drawings into polymer canes. The detail and dimension in this cane have given her enough material to last through the end of her 100 Day project. You can follow along on her Facebook and Instagram. In the last few days of the project, she’s had a burst of energy and playing with layering translucent clay, alcohol inks, silver leaf, embossing powder, and acrylic paint. Her stunning progress may make you want to consider joining in the next 100 Day creative marathon. Colorado’s Laura Schiller decided to take a break after years of focusing primarily on pairing polymer and eggs. 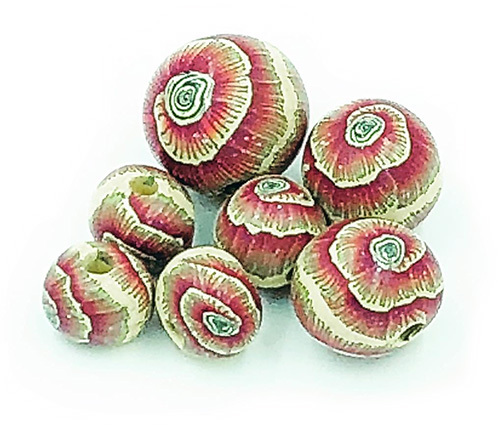 Laura’s known for her elaborately drilled and designed shells. Here she is on Facebook. After drawing zentangles on polymer-covered eggs, she wondered what would happen if the popular drawn zentangles were white on white. Then she wondered about zentangles that evolved to 3D in black and white. Off she went on her tangent with no thought, no color, all play. 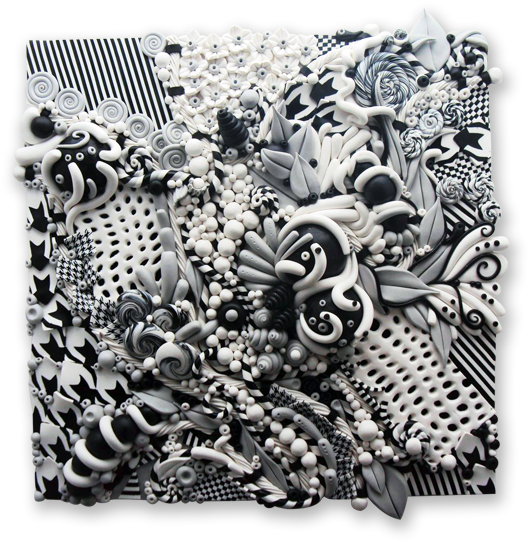 The latest result is this 11″ square tile, a zentangle gone wild. Now that Laura’s got it out of her system, she’s happy to return to the nest. She leaves us to consider what might happen to zentangles next.